ACHIEVE THE DEEPEST, RICHEST, MIRROR-LIKE SHINE WITH OUR BIKE WAX. THE EASY ON, EASY OFF FORMULA IS APPLIED WITH MINIMAL BUFFING. PROVIDES SHINE AND GLOSS TO YOUR BIKE. 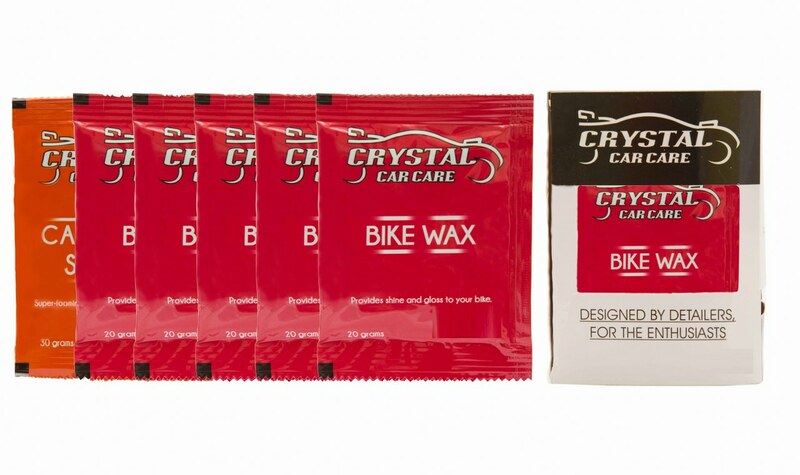 PACK CONTAINS 5 SACHETS OF BIKE WAX AND 1 SACHET OF CAR WASH SHAMPOO. HOW TO USE APPLY ON A COOL CLEAN SURFACE OUT OF DIRECT SUNLIGHT. APPLY WAX WITH AN APPLICATOR PAD, ONE SECTION AT A TIME. BUFF LIGHTLY WITH A CLEAN, DRY POLISHING CLOTH. 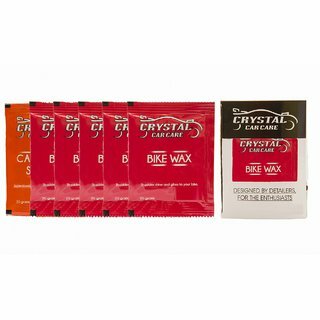 FOR BEST RESULTS PRE WASH THE BIKE WITH CRYSTALS WASH SHAMPOO AND USE POLISHING CLOTH TO GIVE YOUR BIKE THE LOOK IT DESERVES.